So, there happens to be this thing called "TennoTyper." It is indeed a website that lets you type in English, and have it pop out an image in the Warframe alphabet of your choice (Grineer, Corpus, and Orokin). Grineer is mostly a straight cipher, as is Corpus (though technically their letters would be jumbled up, if you look at the Wiki page for the Corpus language it explains what I mean), but obviously the coolest thing is the Tenno cipher. You have to type in phonetics for it to be accurate (recommend turning on "manual override" so you can do this more freely, otherwise it tries to guess how the word is pronounced, often poorly), but there's a cheatsheet that explains that, and it's right there on the website too. I realize this sounds like an infomercial but it's pretty cool, and it's definitely preferable to trying to draw out the Orokin alphabet for yourself (unless you have a calligrapher's ink pen and actual artistic talent). This is "pizzacheetah" in the Tenno alphabet, or more specifically, it's "peetsucheetu," because of the aforementioned phonetics. Has Warframe really been out since 2014? Just got it a couple weeks ago, I thought it was a year old at most, lol. It's pretty fun. It feels like I'm Genji with guns. It's been out since like, 2012 or 2013, mate. It was in a beta state then, but I've been playing for almost five years now. And believe me, you wouldn't recognize the steaming pile of hot garbage that was early Warframe. Saying the game has come a long way is a drastic understatement. Oh... wow. I feel kind of late. So I just captured my first Teralyst...alone. I am NEVER doing it alone ever again. Don't read this if you haven't completed The Second Dream and The War Within yet. Like I said, I am never doing that alone ever again. On the bright side, I did get a lot of cores and some Eidolon shards. And I also got the trophy for capturing a Teralyst since I am on PS4. I like Cephalon Invader of Personal Space the most. "I'm doing my college work, I swear!" So yeah, on console I got the Invati Sekhara even though I never did a single raid. I bought the BP's for the keys as I thought they would be legacy items (but nope), so that might have been a factor. I'm not exactly complaining, but I am certainly not going to wear the sekhara at relays or public areas. It would be a little awkward for me. FashionFrame compels me. I got it too. What is it exactly? It is a badge meant to commemorate trials like Law of Retribution, Law of Retribution Nightmare, and The Jordas Verdict being shut down for now. And like I said in the initial comment, You get the badge if you have completed at least one trial (of to which I have not). Someone messed up somewhere along the line. I cannot really blame DE though as they are working on the Venus free-roam area, The Sacrifice, Umbra Warframes, Khora, The Odachi Warframe, Melee 2.5, revisiting old content for updating, The dark sector rework, void onslaught, and whatever else we don't know about or that I am forgetting. Mistakes and acidents happen. The Sacrifice is coming out real soon! So I am coming up on my Riven cache login reward. I have no idea what I am going to get with my three rivens (hopefully at least 1 is for a weapon I actually own). Now I have some forma and some forma crafting. I plan to use these on Excalibur Umbra when I get him. Here is the thing though: My Fang Prime gets priority if I get a Fang riven. I will have to get more Forma for Excal Umbra. Oddly I have been doing a lot of Kuva Siphons recently, so that is life telling me "Hey, hey buddy...you are going to get a riven you can actually use." We shall see in 2 days which saddly is one day after my birthday...unfortunate timing. 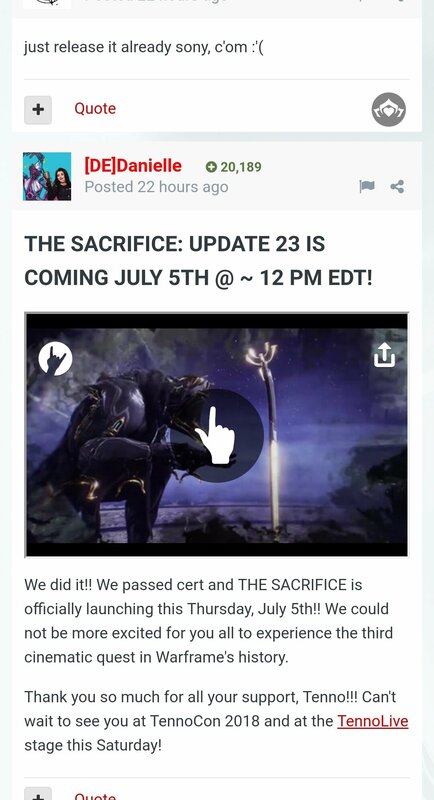 Hopefully The Sacrifice doesn't take too long to release on consoles. Sanctuary Onslaught is really testing my patience when it comes to getting Khora. I got everything I need except for the main BP. On the bright side I am getting a good amount of Lith and Meso relics and some Neo relics.